When we have some less common veggies in the garden, I always try to cook something with a few of them to show how they might be used and to give them a fair taste test. Many of you know that I’m not a huge fan of eggplant, but I decided that I should give an eggplant dish a try anyway. I also made stewed okra and tomatoes, because I’ve never really cooked with okra before and wanted to try it in a form other than breaded and fried. I like Thai food, and we had all the recipe and sauce ingredients on hand, so it worked out well. 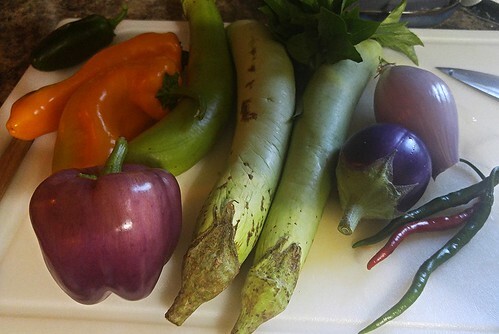 I used the green Oriental eggplant, the yellow ‘Escamillo’ sweet peppers and one of the purple sweet peppers, one of the Round Purple Asian eggplants, a red onion from my home garden, and a couple ‘Gong Bao’ peppers from my home garden in place of the serranos. I also used Thai basil rather than regular sweet basil. I found the sauce to be a little heavy, flavor-wise. It probably needed a bit more acid, maybe some lime juice. 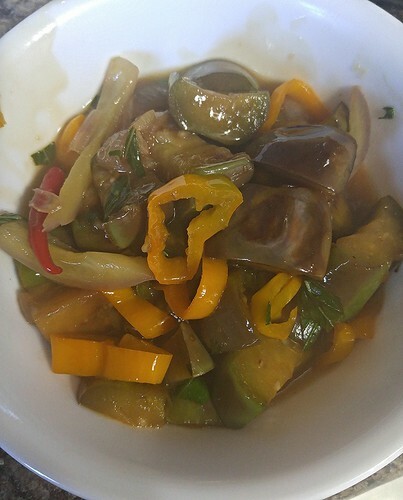 Overall, it wasn’t bad (for eggplant). The texture still isn’t my favorite, but it wasn’t completely distasteful. I used the okra and tomatoes from the garden, including some of the big okra that is larger than would typically be ideal. The ‘Ladyfinger’ okra that we are growing is supposed to be tender and usable even at larger sizes, so I wanted to test that out. I would say that it was nice and tender after the stewing, up to about 10″ long. After that, the pieces were still a bit fibrous and woody. I doubt a longer cook time would have solved the problem. Both recipes were fairly easy, did a nice job featuring the vegetables, and were tasty. 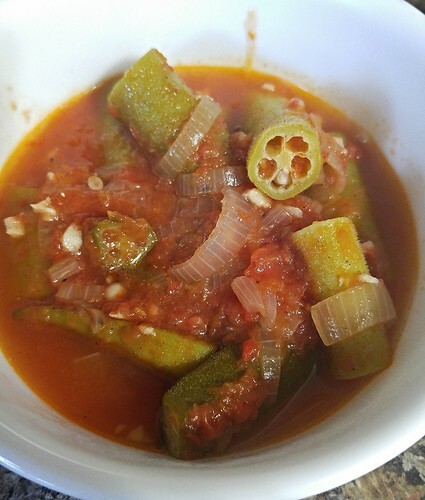 If you are looking for a recipe to use for eggplant or okra, give these a try! Our second garden bed this year is featuring things purple. I think the name that has waffled between “K-State Purple Garden” and “For the Love of Purple” garden. At any rate, we are growing and eating purple plants! The garden plan pictured above is not the final plan, just a temporary plan to make sure we have space for everything. We hope to rearrange the plants into a more ornamental-edible garden before we are ready to plant. 1 & 2: ‘Cardinal’ Basil has attractive purple flower heads while ‘Aromatto’ basil has purple stems, flower bracts, and purple-green foliage. 3 & 8. ‘Goodwin Creek’ and ‘Otto Quast’ Lavenders both bloom purple the first growing season. We grow these varieties as annuals here. 4 & 6. ‘Benary Giant Purple / White’ Zinnias are the most common cutflower zinnia. We’ll have both purple and white varieties. 5. ‘Dara’ Ammi is actually a falsa Ammi that is a carrot. But this carrot doesn’t often develop a good root and does bloom readily with a range of white to purple flowers. 7. Vinca and Gomphrena will add some more purple flowers to the mix. 9. ‘Integro’ is a red / purple cabbage with medium sized heads. 10. ‘Kolibri’ is a purple, hybrid kohlrabi. 11. ‘Ip Ssam Hong’ is a purple chinese cabbage that doesn’t form solid heads. 12. ‘Amethyst’ is a spring radish with purple skin and white flesh. 13. ‘Thurinus’ lettuce is a dark red/purple romaine that we grew in the garden last year and decided to reprise. 14. ‘Hansel’ Eggplant is an All America Selections winner from 2008 that features small, slender, dark purple fruit that are great for grilling. 15. 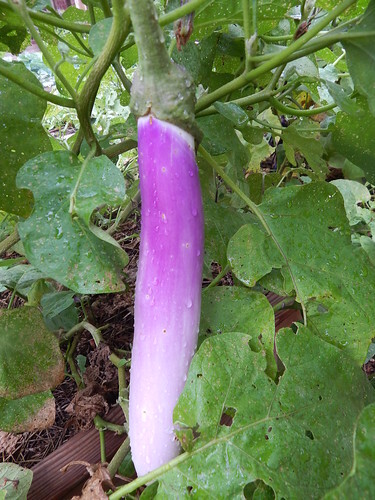 ‘Gretel’ Eggplant is a 2009 AAS winner that has fruit similar to ‘Hansel’ but white. 16. ‘Islander’ is a bell pepper that has lavender skin which then ripens from yellow to orange to red. 17. Purple Cayenne pepper is just that – a cayenne pepper with purple fruit and a purple tinge to the leaves as well. 18. ‘Purple Star’ is another purple bell pepper. It starts as a dark amethyst purple and ripens to red. 19. ‘Royal Snow’ snow peas are a purple podded snow pea. Most descriptions say that purple podded peas are a little bit bitter, so we will have to try it and report back! 20. ‘Purple King’ pole bean will be planted on the same trellis as the snow peas, but in the mid-late summer for a fall crop. As we discovered last year, fall planted pole beans are much more productive than spring. 21. ‘Black Beauty’ tomato is one of the newer varieties with the very dark purple / “indigo” coloration of the skin. This one is more a slicer size with red interior flesh. This one is purported to have great flavor. 22. ‘Fairy Tale’ eggplant is another AAS winner from 2005. It also has small fruit but with white and purple streaks. We have grown this before, but several years ago. 23. ‘Purple Bumblebee’ tomato is a cherry tomato that is a more traditional purple tomato color – similar to chocolate cherry – but with metallic green stripes. 24. ‘Graffiti’ Cauliflower is a purple-headed cauliflower. It is the only hybrid purple cauliflower, and has by far the best purple coloration of any purple variety. We will be planting this for fall. 25. ‘Rosalind’ Broccoli is a purple-headed broccoli. This will also be fall-planted. 26. ‘Purple 68’ Carrot is a variety that has deep purple coloration all the way to the center of the root. It is best grown in the fall. 27. ‘Da Hong Summer’ is a purple bok choy that is bolt-resistant. 28. ‘Redbor’ Kale is a purple kale that has deeper color the colder it gets in the fall.